Lothar Matthäus is an exception. At the age of 19, he participated in the presentation of the 1980 European Cup trophy. Ten years later, he led West Germany to win the World Cup title for the third time. time. At the club level, he has won seven Bundesliga titles, two UEFA and one Italian Serie A trophies, in addition to other national titles. As a player, he was twice the best player in Germany (1990, 1999) and the first player to receive the FIFA World Player of the Year Award, first awarded in 1990. Maradona l called the most powerful adversary of all time. In Germany, the prestige was lost only by "Der Kaiser" Franz Beckenbauer himself. Nevertheless, Lothar Matthäus is an anomaly. Although he is one of the talented players born from the Panzer team, he is not a beloved figure of the German public. Moreover, the German public seemed to have a hard time respecting Matthäus and considered him more like a wind. Simon Kuper, author of The Football Men: Up Close with the Giants of the Modern Game (2011), explains in the chapter "Lothar Matthäus: The Tabloid Reader" how the Germans can be portrayed in their attitude towards Lothar Matthäus. "The German scholar despised Matthäus because he was not an educated man ... People did not make fun of Matthäus because they despised most Germans on Matthäus because he was a Bayern player. Bayern's players were not so enthusiastic about him because he disfigured his club for twelve years. " Born on March 21, 1961, Matthäus grew up in Herzogenaurach, a small town in northern Bavaria. According to Kuper in 1961, Herzogenaurach had a population of less than 20,000 and was known only for two things, Puma and Adidas headquarters. Matthäus's parents worked in Puma. The father, Heinz Matthäus, worked as a messenger, while the mother, Katherina, worked at home on the leather rushes. In 1979, Matthäus joined Borussia Monchengladbach. A year later, he was summoned by the Western Germany Senior National Team participating in the 1980 European Cup. He made his debut when Germany faced the Netherlands in the group stage. However, according to his confession, his real debut only occurred at the 1986 World Cup. At that time, West Germany qualified for the final against Argentina. By Beckenbauer, Matthäus was ordered to keep the Maradona movement. Germany went with a score of 3-2. Four years later, at the 1990 World Cup in Italy, Matthäus became captain and managed to retaliate by beating Argentina 1-0. This is undoubtedly the culmination of the appearance as well as the success of Matthäus. However, a glorious reputation in this area was accompanied by another reputation outside the field. Matthäus is known for his inability to keep his tongue. That's why, despite his admiration, Matthäus has never been the person he loves. This reputation is attached to Matthäus from the beginning. In 1980, Ribbeck, assistant coach of West Germany, already spoke about it. "Even when we were discussing a meal plan, he kept talking," he told the Guardian. In fact, many football players like to talk. One of them is Johan Cruijff. 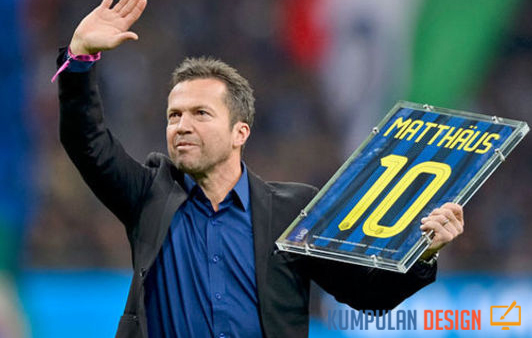 However, what distinguishes Matthäus from the legendary Dutch player is the content of his speech. Matthäus has a habit of criticizing his teammates and disclosing internal discussions with the media. This habit made him fight with almost everyone.